CicLAvia South LA is approaching – so mark your calendar for Sunday, December 7 from 9 a.m. to 3 p.m. and make sure not to miss this fun-filled event! 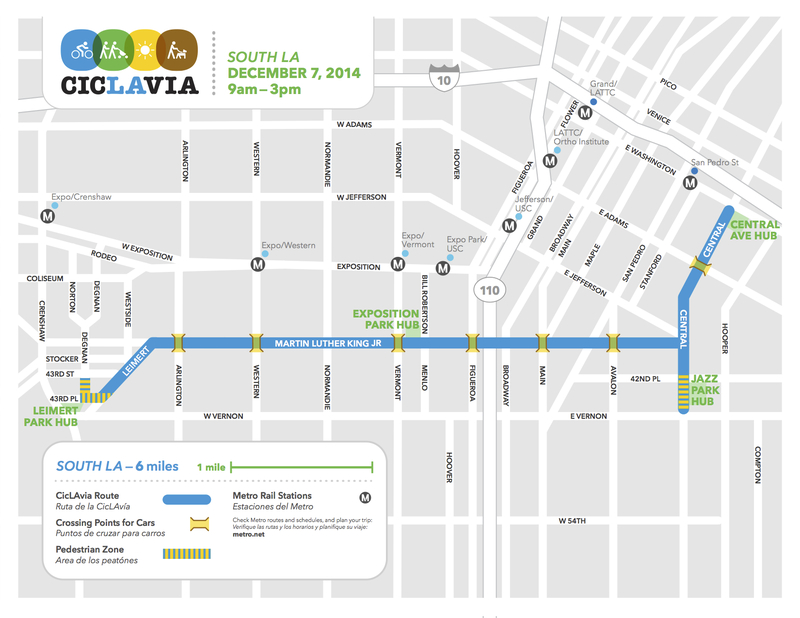 This is the 11th installation of CicLAvia — since 2010 CicLAvia has successfully held ten events. The events promote bicycle and pedestrian awareness by connecting the region through public spaces that are temporarily free of automobile traffic and open to those who don’t need a motor to get around (i.e. pedestrians, cyclists and others). The South LA route will connect Leimert Park with Historic Central Avenue, traveling along Leimert Boulevard and Martin Luther King, Jr., Boulevard with a spur north and south on Central Avenue to Washington Boulevard and Vernon Avenue. Participants will be able to enjoy the sights, music, food and culture that make South LA such a vibrant part of Los Angeles. The South LA route is accessible by the Metro Expo and Blue Lines – so if you’re too far to walk, bike or roll directly to the event, Go Metro. Exit at the Expo/Western, Expo/Vermont or Expo Park/USC Stations on the Expo Line or San Pedro, Washington or Vernon Stations on the Blue Line. Metro buses also travel in the area but many will be detoured in order to accommodate the event. Metro buses can carry two bikes on the front rack at a time. CicLAvia and other “open street” events are inspired by “Ciclovias” (Spanish for “bike path”) started in Bogotá, Colombia, over thirty years ago as a response to pollution and congestion on city streets. CicLAvia is a nonprofit with a mission to encourage safe, vibrant public spaces, sustainable transportation and public health through a program of open street events. Metro staff will be on hand at the Metro Booth, located at the Leimert Park Hub, to answer questions about how to ride bus and rail in Los Angeles County, load a bike on to a bus bike rack, and provide input about various projects including Metro ExpressLanes, the Crenshaw Light Rail Line and Active Transportation programs around the region. Stop by the Metro booth with proof that you like Metro on Facebook or follow Metro on Twitter to receive a free bicycle light while supplies last. Staff will also be promoting Metro’s Safe Routes to School Program, the MetroBike Program, the Metro ExpressLanes Low-Income Assistance Plan and the Eat, Shop, Play Crenshaw campaign. The Eat, Shop, Play Crenshaw campaign is aimed at raising awareness in the Crenshaw community (and regionally) supporting local businesses during construction of the light rail line. To support the Eat, Shop, Play Crenshaw campaign event participants are encouraged to tweet #ESPCrenshaw. Metro Safe Routes to School Pilot Program staff will be on hand with costumed characters and activities for kids. Tagged as: Central Avenue, CicLAvia, Expo Line, Exposition Park, Go Metro, Leimert Park, Martin Luther King Jr. Boulevard, South L.A.